Fieldstone House enjoys a fantastic position at the foot of the Baw Baw and Yarra Ranges National Parks. To compliment the fantastic position, we continue to make improvements to ensure your experience is as good as the views. The refurbished kitchen bench, new cooktop and rangehood (nicknamed “Darth Vader”) make cooking those hearty meals a joy, while the new wood burning fire compliments the open fire place at the opposite end of the living area. Together they keep the whole house warm and cozy on those cold wintery nights. Also new to the kitchen is the under-sink water filter. On the outside, we’ve installed 2 new water tanks to ensure everyone gets a nice hot shower. The brick paving has been completely dug up and re-laid and mortared, the front porch has been re-concreted. We’ve also laid new flower beds to improve the ambience of the gardens. And at the end of the day, when it’s time to settle down and unwind, the newly re-tiled spa is there to relax those tired muscles by the moonlight. It really doesn’t get much better. We understand that our position at the foot of the Baw Baw and Yarra Ranges National Parks also potentially poses safety concerns, especially during the hot, dry summer months. To this end, plans are afoot to install a bushfire bunker on the property to ensure that even if the worst does happen, our guests will always be as safe as possible. We have, and will continue to, invest in Fieldstone House to ensure that it continues to provide magical moments and lifelong memories to those who choose to enjoy its facilities. Up on the Gippsland hills tucked away in Neerim North is a historic getaway aimed to please. This retreat aptly named Fieldstone House was built in the Gippsland hills using local bluestone and fieldstones from the area and the original part of the house was built over 100 years ago. You can feel the history around you when you walk in and some of the photos provide a great visual of what life was like back then. So what can you find here? Well if its peace and quiet you are looking for then look at this accommodation in Gippsland because sits on 150 acres of hilly land and backs onto the state forest. Some of the trees around the place are as old as the house, if not older. If walking is your thing then you will certainly enjoy the workout because walking around this land takes stamina. If you venture into the forest you might be lucky to hear or see some of the animals that live there. Be careful though – it’s a big forest with big animals. Otherwise the only sounds that are heard are from native birds and some frisky cows that happily graze. 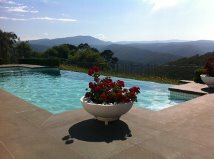 This part of Gippsland is so hilly that no matter where you stand on the property you are confronted with nature lending an artistic landscaping hand and if you find yourself at the pool then the views from there are absolutely breathtaking and leave you wanting to stare endlessly. The large fire place in the living room enjoyed best during the colder months with a glass of red and a good book or movie is a great way to warm up a cold evening. The pianola in the sitting room can fill the house with old tunes. Children especially gravitate to it to discover their musical potential. 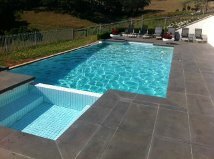 This entry was posted in Accommodation and tagged accommodation, Gippsland, stone house, views on February 20, 2014 by admin.